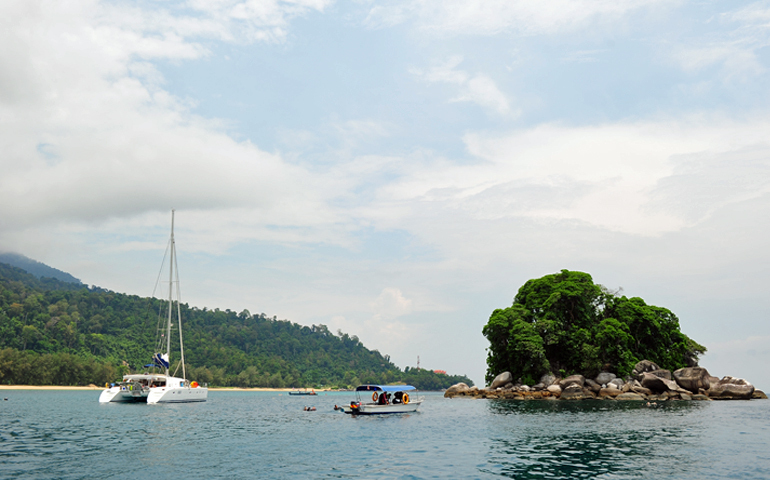 While Tioman is part of Pahang, the main gateway to this sunny isle is through the Mersing jetty located in Johor. If you decide to drive to the jetty, be ready for a long drive on quiet roads that take you through small towns and villages along isolated rainforests before you reach the jetty. This can be a fun road trip on its own if you’re feeling adventurous, but be sure to put aside a day out of your entire trip to do so as it can be very time-consuming; the drive from Kuala Lumpur to Mersing takes about four to five hours with some 400km to cover. Once you get to the jetty itself, there are allocated parking lots that cost from upwards of RM10 per day. If you choose not to tire yourself or risk getting lost driving, buses are an option too. The bus journey from Kuala Lumpur to Mersing bus terminal takes roughly six hours and upon your arrival at the terminal, the jetty is just a kilometre’s walk; alternatively, you can take a cab to the jetty for about RM10. Whether you choose to travel by bus or car, be sure to synchronise your time of arrival with the departure times of the ferries to avoid having to waste hours waiting or even putting up at a hotel nearby for a night. Ferry services are extremely limited and tickets should be bought in advance with no guarantees that you’ll leave on time, if at all, as travel times are often determined by the number of passengers (or lack of them) as well as the tides – especially during the monsoon season. There are generally two to three trips per day; the earliest leaves at 8.30am from Mersing and the last shortly after lunchtime. The Mersing-Tioman journey takes about two hours, depending on tidal waves and which village you choose to get off at on the island. The ferries are fully air-conditioned, relatively clean, and are big enough to feel safe on shaky waters. While the murky water around the jetty might put you off with its stench, fret not as it isn’t in any way representative of Tioman Island’s environment. For high rollers, private yachts can be brought and docked at the marina, which is equipped with power and water supply. 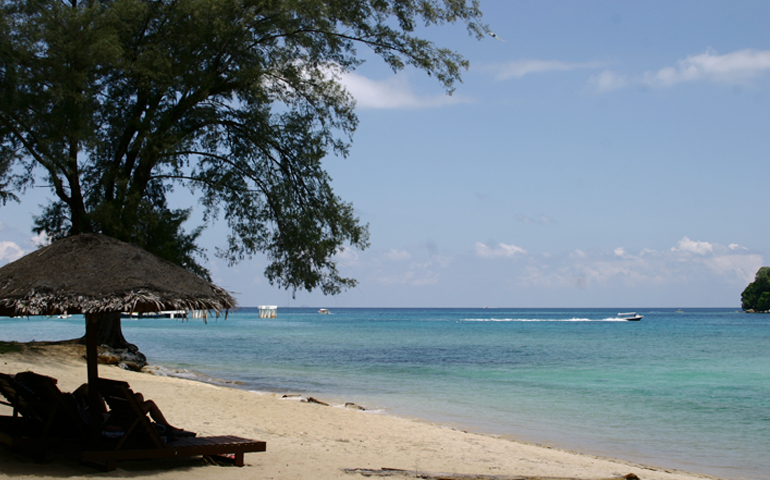 It’s located near the jetty in Tekek village where the customs complex is located, so you can get your passport stamped here and charter a speedboat to head to other villages if you fancy it. If you prefer to travel by air instead, some of the high-end resorts offer flights to and from their resort, such as the Tunamaya Beach & Spa Resort. A RM5 conservation fee is applicable to enter the island no matter whether you arrive by ferry, flight, or private yacht. Similar to Langkawi, Tioman has a bird statue of its own in Tekek, the main village, which is tied to one variation of how the name Tioman came to be. The bird, a myna called ‘Tiong’ in this case, was said to be a favourite pet of fishermen on the island for its beautiful vocals. When Tiong passed away, they decided to name the island after Tiong by merging its name with the word ‘teman’, meaning ‘friend’ in the Malay language. This duty-free island is a popular choice among youngsters and tourists not only for its picturesque beaches, lush rainforests and colourful marine life, but also because goods like cigarettes and alcohol are sold for cheap. 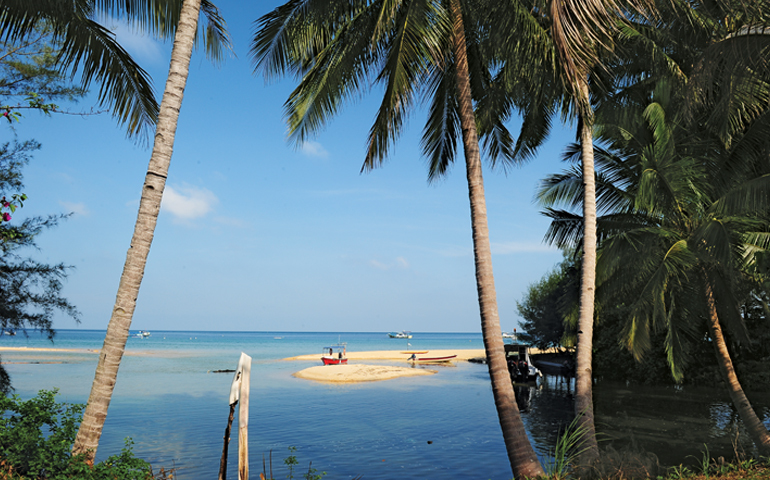 Tourists flock to the island during non-monsoon seasons in large numbers (June being the peak) and it quiets down with many hotels and chalets closing during the monsoon season, so ‘living’ costs for travellers here in Tioman can get rather pricey. Since locals make their living through the tourism and hospitality industries, travel costs (speedboats, motorcycles, and jeeps) get marked up and many try to pull a fast one on unsuspecting tourists. Getting around from one village to the other can be done either via trekking through the jungle or by hiring a speedboat. However, if you plan to make one-way trips, it’s best to wait for the ferry itself as it will be a fraction of the speedboat charter cost. When it comes to food, seafood and local dishes are commonplace on the island with the exception of resorts and luxury hotels. Food tends to be on the pricier side as well to say the least; a standard nasi lemak can cost you about RM15 and a glass of tea or coffee is almost RM7, something you’d expect in the big city, not on a distant island. Accommodation-wise, prices vary depending on your preferences. There are plenty of budget home stays and mid-range hotels on the island that are reasonably priced. Luxury resorts with private coves and beaches are also available for those with expensive tastes, however you risk missing out on an authentic Tioman experience. 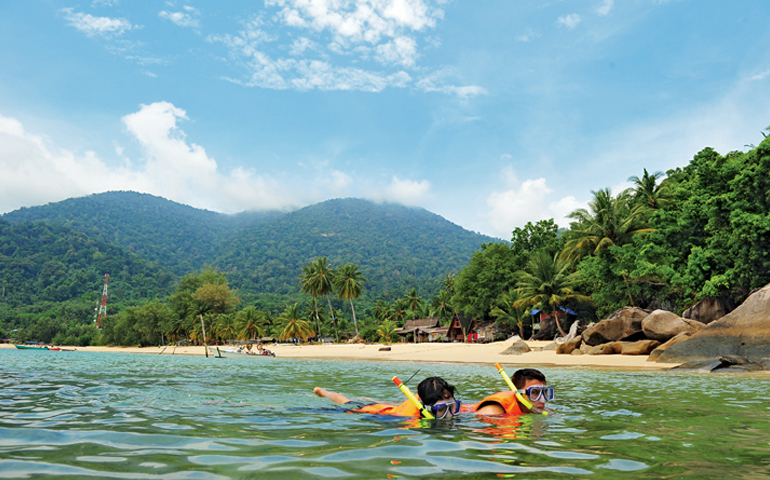 Tioman has much to offer thanks to its natural wonders. There’s never a shortage of water-based activities on this island, ranging from snorkelling and windsurfing to sailing and diving. Local speedboat operators can take you to scenic hotspots and some of them can even arrange for you to explore the smaller, uninhabited islands to enjoy the rich marine life in the area. However, be wary of small jellyfishes and sand flies in these parts, especially the latter, as their bites can itch for days. Every village here is small and can be explored within a day at most – some even half a day. There are a handful of small villages in Tioman, however Tekek is your one-stop village for almost anything you might need on your trip – a clinic, a bank with an ATM (the only one on the island) cyber cafés (which you might need as there’s barely any network coverage), and even a sundry/souvenir store that sells insect repellent, clothing and general remedies. Tekek is also the easiest village to get speedboats and other forms of transportation to travel around to other parts of the island if you don’t fancy trekking through the jungle. From Tekek, you can hire a jeep to take you up across to the opposite side where the Juara village is located. There’s a marine park located in Tekek where you can feed fish with bread from a safe, dry distance up on a jetty, or you can jump in with a snorkel and swim with butterfly fish, Napoleon fish and neon-hued parrot fish in the colourful sea garden. Free diving (up to about 30 metres) is also an option; there are instructors here who can provide training certification too. Juara is a simple village nestled within a secluded bay along the east coast of the island where ferries and speedboats don’t go. The only way to get to the peaceful village is by hiring a jeep in Tekek, which will take you on a bumpy, challenging trail cut through the lush mountain. If you don’t mind a slight detour, you can arrange to have the driver drop by a beautiful waterfall located on the path to Juara beach for a cool dip before heading off. Don’t worry; there’s no extra charge incurred. The main attraction in Juara, however, isn’t the beach – it’s the turtle sanctuary. There are volunteers from different countries who come for certain periods of time to take care of the blind turtle as well as protect eggs from local poachers who consume them as aphrodisiacs. Entry requires a minimum RM10 donation fee. 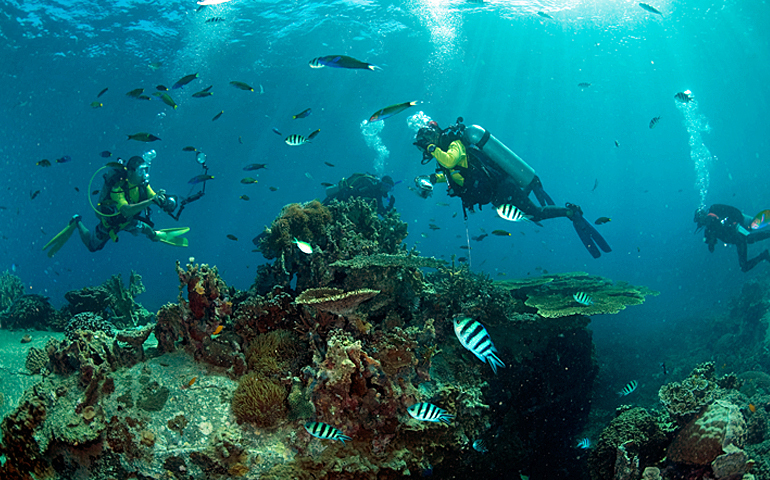 The villages of Salang and ABC are diver’s dens as they are the closest to various reef sites – including Coral Island – with an abundance of diving-related facilities for convenience. Salang is the last stop the ferry makes on Tioman before it returns to Mersing. Both these villages are filled with budget hotels (some of the cheapest on the whole island), so will naturally attract many backpackers. Due to the younger, backpacker-centric crowd that favours Salang, the nightlife here consists of a high concentration of pubs and beach bonfires by resorts. If you prefer being on land instead of on the sea, you may embark upon a 3km jungle trail through Monkey Bay that will bring you to ABC. The charm of these villages is their relatively low density and rustic surroundings that preserve the natural surroundings, unlike the development-heavy Tekek. Genting and Paya are popular choices among Singaporean tourists. The weekends are usually the busiest for these places with karaoke going till late in the night. Due to their rich rainforests and relative seclusion, monkey and monitor lizard encounters are fairly common in these villages, allowing you to really experience nature up close. Though the beach itself is rather rocky with large boulders, the water surrounding the beach is clear, making for good photography opportunities here. In Paya, there is an abundance of mangrove swamps and beautiful mountain slopes for nature lovers to explore, or you can choose to challenge yourself and conquer the highest summit of the island – Gunung Kajang. Otherwise, follow the trail at the northern end of the island to make your way back to Tekek.